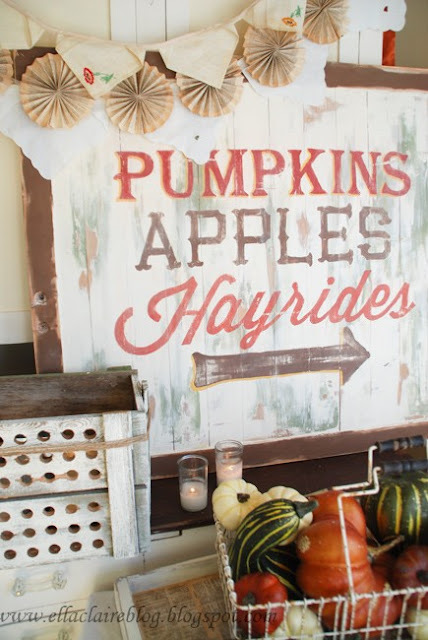 Did you have a GREAT beginning of Fall this weekend? Jax and I rested, watched cartoons, cleaned a little, went to Mass, took naps..and just enjoyed staying home and relaxing. 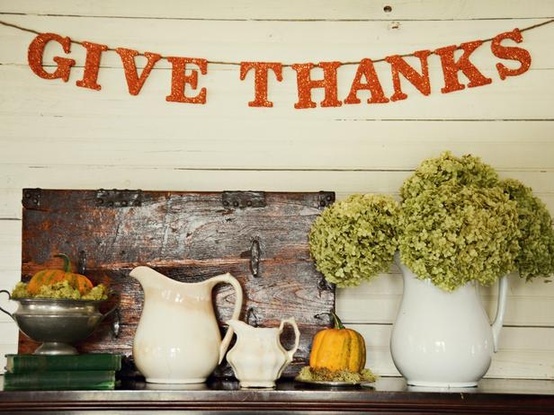 Since it is now officially Fall I thought we should celebrate by ooing-and-aaaahing over some cute decorations!! 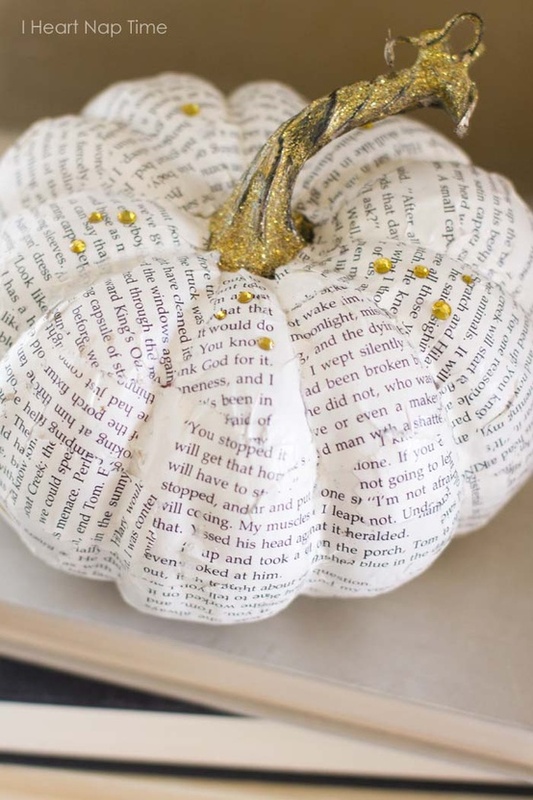 I absolutely adore this book pumpkin. Book pages + modge podge = super cute!! How cute is this sign?? Find some old wood and jazz it up with paint and you are good to go! I'm so wanting to do this!! 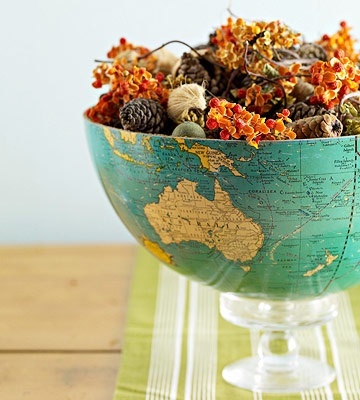 I'm a HUGE sucker for vintage globes. If I could ever bring myself to cut one in half...I would so do this. LOVE IT! 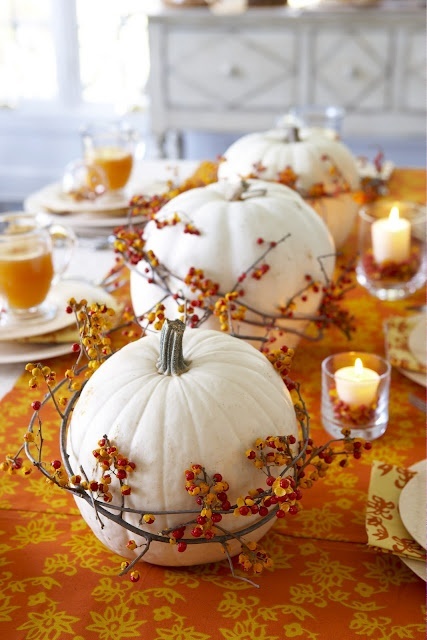 Love, love, love the effect of these white pumpkins. I have a few old, orange ones that could use a face-lift and I'm thinking a coat of white paint might be just the perk they need!! Sneak peeks of a recent wedding shoot…. Earlier this month I had the most wonderful honor of capturing this precious couples wedding day. Weddings are my favorite of all favorites to shoot. I love to see all the beautiful emotions of the day…and to capture every second. Aren’t they all just…absolutely BEAUTIFUL!! This is my favorite shot…so far. I will share a full preview their big day when I finish. And yes…I will be sharing more sneak peeks and previews here. I have gone back and forth trying to decide just how to incorporate both of my little babies…my blog…and my photography company. I simply cannot keep up with two separate blogs. So…I thought hello….I can share all of my sneak peeks and previews here…all in one spot! Plus you guys can see what I am up to besides all our blog fun!!! Have a WONDERFUL and BLESSED day! Did you know it’s the first day of Fall?? Yaaaaaaaaaaaaaaay! It’s MY FAVORITE! And we will be pulling out all the PUMPKINY and FALLicious decorations today!! You already know I adore Bento-style lunches. And that I’m always looking for lunch inspiration for Jaxon these days. At his Montessori school he has to bring his own lunch…but it must be sugar and peanut free foods. Here are a few lunches from I made him last week…. And no he doesn’t have strawberries every day…lol. I do try to rotate between his favorite fruits. I just happened to only take strawberry pictures!! He will not eat vegetables. An occasional nibble of a carrot…does that count? And I put baby carrots in his lunch but…they always make it back home…untouched. We do not have the actual Bento boxes for lunch…but I’d say we are doing a great job of making do with what we have. And so far…he’s eating pretty good. He doesn’t eat it all…but he’s three. And at two…he barely ate anything I felt like…so this is monumental LOL! If you have any lunch ideas for toddlers…that are peanut and sugar free I’d love to hear them!! I’m always up for new food ideas for my Jax!! Today it is foggy, cloudy and chilly in Alpine, Texas. I am in absolute HEAVEN!! After a day of work at the Writing Center, all I can think about is baking, cleaning and getting all my Fall decorations out!! I love this weather!! And to add to my Fall atmosphere at home…I pulled out a bag of freshly roasted coffee my sweet Mamma roasted for me this past weekend. I am a spoiled rotten coffee drinker…because of my Mamma! She roasts her own coffee and is always sharing her goodies with me! It is DELISH!! And what a perfect day to enjoy a perfect cup of joe! Hi everyone! Sorry for the absence. Our new routine of school and all the new changes has of course..changed everything for us! Including my blogging time! But we are still here…and doing GREAT! I have been meaning to share some fun pictures with you from last weekends Big Bend Balloon Bash. I have never seen a hot air balloon up close have you? I was THAT CLOSE! Can’t you just hear the flame?? TOTALLY RAD! I loved all the COLORS!! I think it would be AWESOME to ride in one. But I have SERIOUS motion sickness issues…so I’m betting it’s probably not a good idea for me. LOL! If you are ever in the Alpine area on Labor Day weekend you MUST check out the Big Bend Balloon Bash. It’s FREE!!! And you can get UP CLOSE and PERSONAL with the balloons. Reminding myself...and you...just how we blessed we are today. **Click the picture for a BIGGER sized image. Feel free to use this photo any way that suits your fancy! It is sized so that it will work as a Facebook timeline cover...or whatever your heart desires.